Although this is small, it packs a great punch! 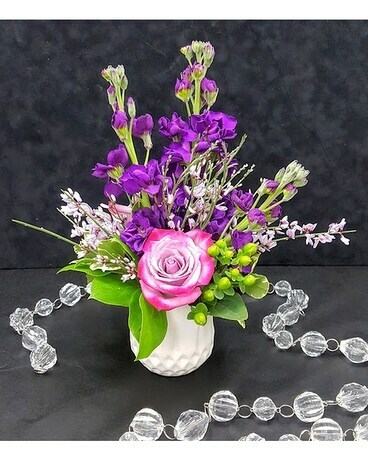 A Timeless vase, roses, and amazing scented stock make this perfect for an at work brag! We'll always make you look good. Add some chocolate that they can share so coworkers don't get too jealous. 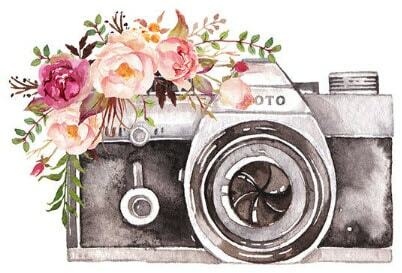 Forget-Me-Not Florist proudly serves all of Northfield, MN. We also deliver to these neighboring towns: Dennison, Dundas, Lonsdale, Nerstrand, Randolph, Webster, Farmington, Lakeville, Faribault, and Cannon Falls. Benson & Langehough Funeral Home, Bierman Funeral Home, White Funeral Home(s) in Lonsdale & Farmington, Lundberg Funeral Home in Cannon Falls, Boldt & Parker Kohl Funeral Homes in Faribault, Northfield Hospital & Long Term Care, Northfield Retirement Community (all bldgs. ), Three Links Care Center & St. Olaf & Carleton Colleges. We offer a huge selection of Fresh Flowers, Tropicals, Plants & European Gardens (Always a nice selection of MN grown product on hand). 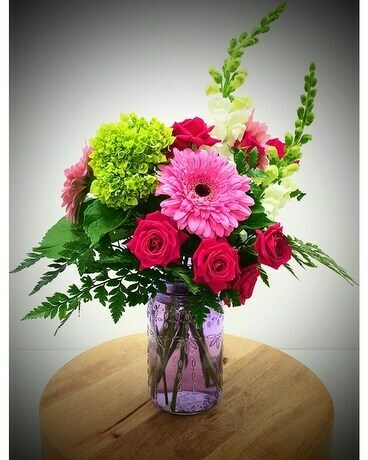 We specialize in Contemporay & Traditional arrangements, High Style arrangements to Hand tied bouquets. We offer Silk & Dried floral arragements & wreaths. We offer specialized Wedding consulting, bouquets & services for any size celebration. We offer modern or traditional Funeral designs, Cemetery Planters (we will store them over the winter if you like), Seasonal outdoor planters & Weekly Plant Care Services (home or office). We also, carry an extensive giftline of baskets, pottery, glassware, greeting cards & more.